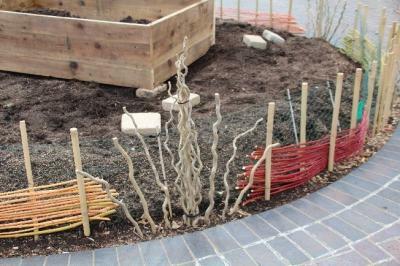 Wattle is not only beautiful but also a great use of repurposed pruning materials. Even if you are unfamiliar with the term "wattle," you most likely have seen examples of fences and other structures made by weaving thin branches ("weavers") between upright stakes ("sales") to form a woven lattice. Check out the Kemper Center vegetable garden at Missouri Botanical Garden where staff are building a short wattle around the central bed using brightly colored weavers and spiral shoots of contorted filbert for additional flair (top image). The more traditional weave would be to weave each row of weavers alternating around the sales, with the next row woven on the opposite side of the sale from the weaver below it. Each weaver row is firmly pressed down before starting the next course. This not only provides support to the sales and the overall structure, but it also hides the sales, resulting in a basket weave appearance. The lower image was taken in Holland and demonstrates a pollarded willow wattle (say that three times quickly!). 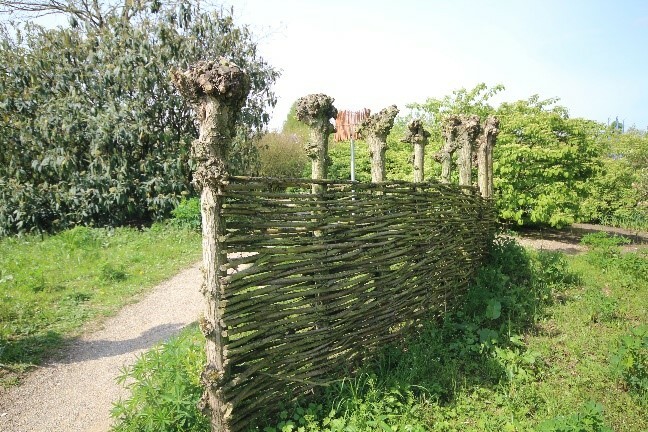 Because willow readily roots from cuttings, the willows not only supply the withes (weavers) through pollarding, the pollard trees themselves act as the sales to create a living fence. If you have some free time, do an image search on wattle fences or a search on how to build a wattle fence and you will find yourself totally absorbed with the creativity and beauty being shown. This has been a great year for hellebores, that is, up until Mother Nature played an April Fool's Day joke on us with snow and freezing temperatures. So, knowing the storm was coming, I took the opportunity to collect blossoms for use in a floral display. Hellebores in general have downward facing flowers, so most passerby miss the true beauty of the individual blooms unless they are displayed in a more upward facing manner. 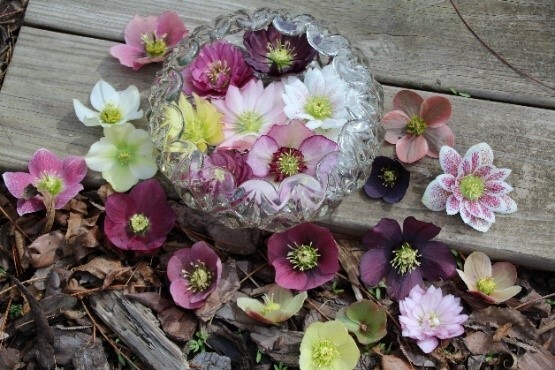 The best method I have found for displaying hellebores is floating the individual flowers in a shallow bowl of water. When collecting the flowers, I try to retain ⅛"- ¼" of the peduncle for water uptake and extension of the life of the bloom. As to the cold outside and its effect on hellebores? Hellebores are cold tolerant plants and will eventually straighten from their current bowed state as if nothing had ever happened. Another reason to love these beautiful winter-bloomers! Let's hear it for ants! Did you know some plants have evolved a method to entice ants to harvest and disperse their seeds? 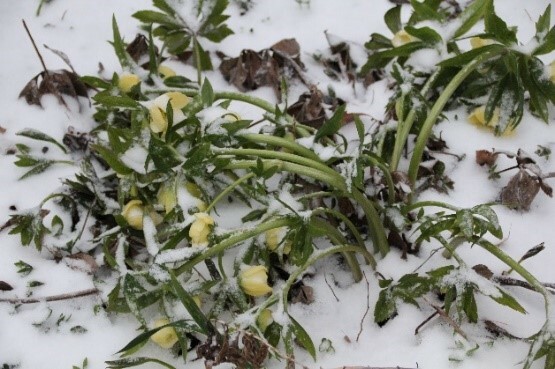 The technical term for this is myrmecochory, and many spring blooming plants like trillium, blood root, twinleaf, hepatica, Dutchman's breeches, squirrel corn, trout lily, and some violets partner with ants to move their seeds from place to place. Ants are attracted to elaiosomes, which is a nutritious fleshy structure rich in lipids and proteins attached to the seed. Foraging ants take the seed to their nest and feed to their larvae. After the elaiosome component is eaten from the seed, the seed is then discarded to their waste area, effectively planting it. Seems like a great tradeoff for all involved, including the gardener who gets more of these spring beauties.